I took a break from the game after about a month of playing after launch. I revisited it a few times over the year but never really got back into it. Just before Horizons was released I started playing again and found a lot of tweaks were finally added, such as being able to plot a course to a station and a workable galaxy map. Right now i'm trying to rank up with Empire to buy the Imperial Clipper. It is going to take a very long time though. By the time I reach that rank, I will most likely have an A rated Type 9. I tried some different ships to see how they work. I enjoy the Diamondback Explorer, nice range and lots of utility. Great exploration vessel. 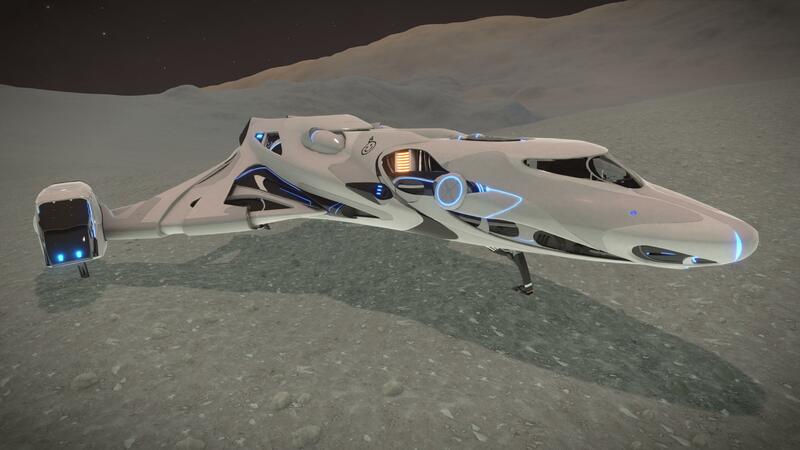 The Viper MK IV I have been using to do Empire missions and bounty hunt. It isn't bad but the medium hardpoints are on the belly of the ship making it difficult to aim sometimes. I am going to try the Imperial Courier next, I hear it is good. Also been trading in the Type-7 when I get bored of killing. Not a bad trader, can make 600k+ per trade so it is well worth the hassle of finding a good trade route. Also been running around on planets doing those pilot rescue missions and general surface exploration. 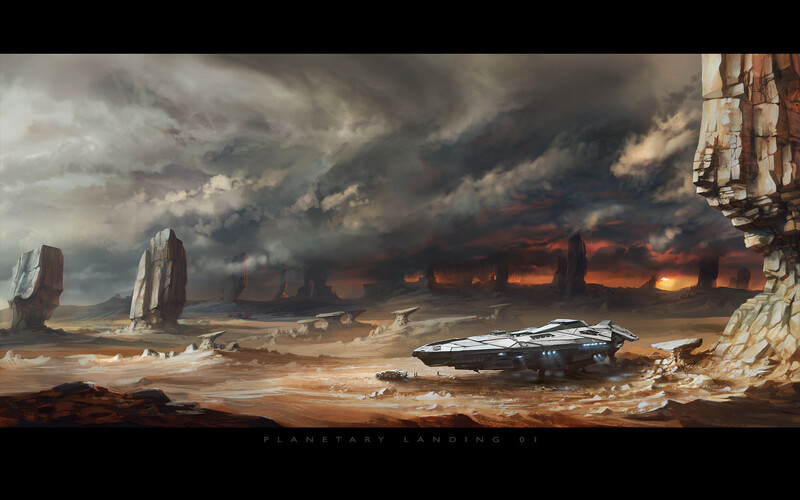 Really looking forward to landing on planets with an atmosphere. Hopefully they give us different SRVs. I am assuming they will since you have to explicitly buy one now. Would be sweet to have some type of flying one or perhaps one with larger cargo or better armed. So what have you been doing in Elite lately? Any recommendations on activities for others? 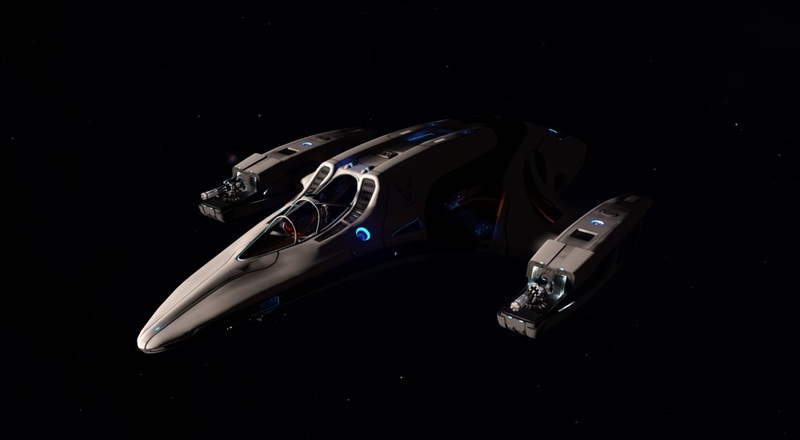 just got the Python last week...what a grind to get it,but worth it.I got it to C class ship,been going bounties with its freaking awesome.Also did some mining with it but bounties pay more per hour i think but only tried about 4 hours with it in mining made 2 million,i can get and average of 1.5 mill in bounties per hour. Sinxar i was wondering about the type 9?How is it? I have no clue. I hear it is crazy good since it is currently the best money printing ship available though. been playing just over 2 weeks according to the system panel, I bought Elite Dangerous just before for Xmas and my very nice wife bought me Horizons for Xmas, so did the Sidewinder then Cobra MKIII then the Asp Explorer, got in the Federal Assault boat now, roughly B class but a few C still in there and for a present to myself dragged out a Cobra MKIV the other day and moderately equipped as a go kart, working on getting the assault all B and a few A. Then maybe work on some kind of transporter, or maybe another Asp for the rare run with a decent heat sink on. Who knows but that is the fun isn't it. Yay finally got it! Took ages to rank up to Master. Gonna be insane to get to Baron for the Clipper. Here is one with the hardpoints deployed. Using 2x multicannon and 1x beam. All medium sized. So far it is working out quite well. It is quite agile for the firepower it carries not to mention the shield strength. Reminds me of flying an Asp Explorer but with the agility of an Imperial Eagle. nice to see you guys playing for a change; its usually me posting stuff. congratulations sinxar on the imperial courier. im not too sure how good it is, as I kind-of skipped it because of money. I was planning checking some of smaller ships again, although it didnt help that I ploughed into a planet (lost nearly 11 million in rebuy). I did have the Type 9 for awhile - its okay to fly, but not a joy. If you are using it for just trading - then its a great ship (nothing near its price range can rival it). But its not much of a fighter, or long-range ship. Does the job, thats about it. Recorded a quick run through a High RES site. Was going to upload it this morning but rendering took way longer than expected. Took two hours to render 15 minutes of footage, didn't have time to upload before work. Guess i'm used to doing short clips. Anyway here it is, it is uncut from the run just before bed with my Courier. Nothing special but it was fun. Came out with a bit over 600k in bounties. Was easy credits with the cops helping! thanks for sharing,just a couple of things I noticed. Firstly, you didnt have a Kill Warrant Scanner. The scanner allows you get more money per kill. I would suggest putting it into your beam weapon fire-group, so you dont have to loose your secondary weapons. Secondly, you can bind a couple of keys to cycle through the enemy subsystem. This saves bringing up the menu and having to search for it. I noticed you had 52mil, so your looking for a clipper soon? Depends on what you mean by soon. If you mean any time in the near future, it is unlikely. It took nearly two weeks of straight rep grinding to get enough rep to buy the Courier... that is rank 3 (Master). The Clipper requires rank 7 (Baron). I don't have the endurance to grind rep for potentially months to get the clipper which is outclassed by the Type-9 and Anaconda, neither of which require any faction rep. I knew about the subsystem cycling but haven't setup the controls for it. I had a kill warrant scanner but it didn't find any other bounties than what they currently had in system. don't know maybe its a bug? ed: turns out the subsystem cycling is bound to 'y' by default. I bound it to a macro key on my keyboard as well. Mostly running missions in my Asp Explorer. Playing with a few configurations, but I'm basically treating it like a bigger better Cobra. Once I find a good home base I'm going to put together a dedicated bounty-hunting Vulture for dogfighting, at which point I may or may not refit the AspX for smuggling. Long term? I only want one other ship: Federal Corvette! And it only took a year of grinding! So yeah, Imperial Clipper. I Googled it and turns out you can rank up fairly quickly in HIP 10716. Pick up all the data courier missions from the outpost and planetary base then jump them 11 LY to a system with three stations. I haven't actually looked on the map but HIP 10716 must be in a strange spot since most of the missions go to that one nearby system. Got my rank up quite rapidly doing this and it can make decent money with the cargo hauling missions available. Overall it is nice to fly. 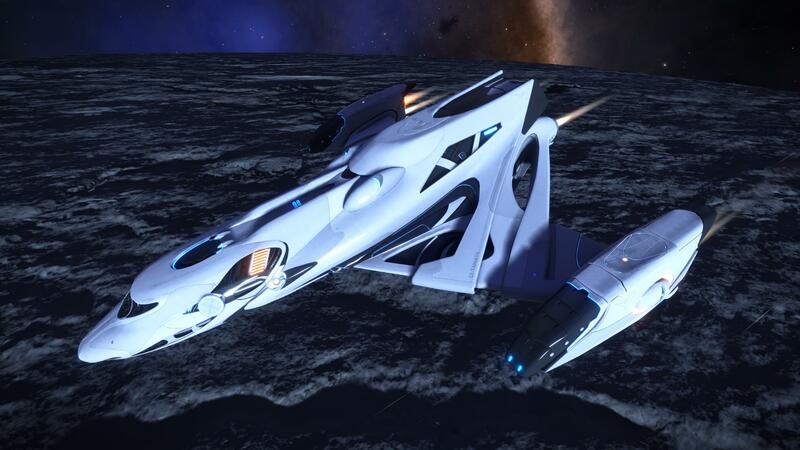 Handles a lot like my Imperial Eagle and makes for a good PVE or trading ship. Sadly it requires a large pad so your options are limited when trading. 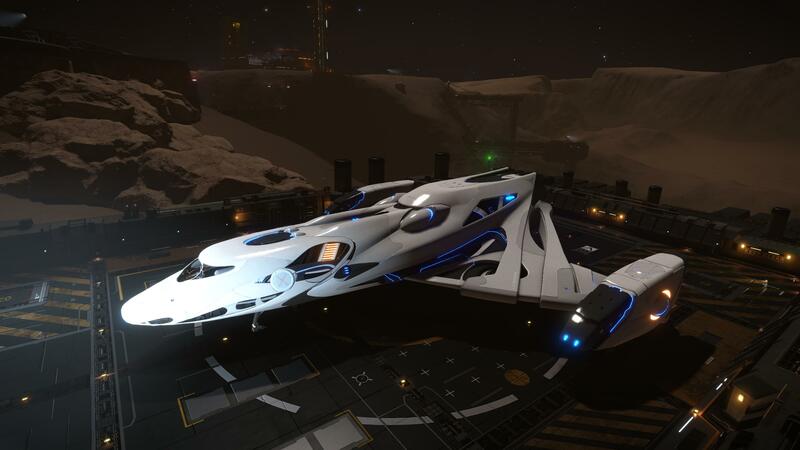 It has a max 27.52 ly jump range and a max cargo of 248t. It can fit a C7A shield and has a top boost speed of 445 m/s. Right now even with a combat fit, it still has enough slots to fit everything I want such as discovery scanner, fuel scoop, SRV bay and a docking computer with 8t cargo room to spare. congratulations sinxar for getting an Imperial Clipper. It is indeed a good all-rounder; capable of trading and combat. The jump range does lack a little bit although, but that's the part of the price you pay. You said its got a maximum of 27.52ly - I guess that's after the engineer mods? As you said you are parked at Farseer Inc. The only other thing is that position of the two guns on the wings isnt great. You may end up sticking turrets in there. To be honest im surprised that your not in something like an Anaconda. Was you held back because of money or rank? Was you held back because of money or rank? Both. I missed all the exploits for quick cash so I only got like 100m. Trading is so boring. Even with a T-9 the money is a very slow trickle unless you got some secrets to share. That jump range was pulled from the wiki so it should be A rated FSD and prolly crap small mods. No upgrades though. This page loaded in 0.0064 seconds. If you like to help, please consider making donation.